This is a staggering image illustrating how LSD affects brain activity. 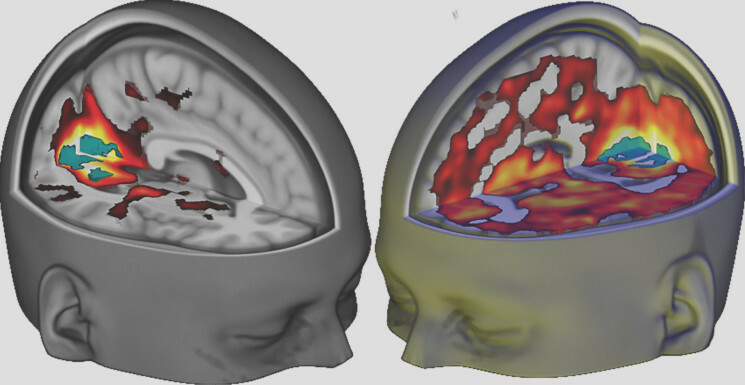 The brain on the left is placebo and on the right under the influence of LSD. When Albert Hofmann first created LSD on his lab bench back in 1938, little did he know that he had one of the most powerful psychoactive substances known to man in his hands, one that continues to intrigue and beguile us almost 80 years on. While its profound psychedelic effects are no secret, the underlying mechanisms of action on the brain and consciousness have eluded scientists. Now, thanks to new research partly funded through Walacea, we are finally beginning to unravel these mysteries. Published in the prestigious journal Proceedings of the National Academy of Sciences, the investigation was actually the world’s first study to look at the human brain on LSD. While the drug may have been around for a long time, unfortunately its unscientific and unjustified classification as a Schedule 1 drug has greatly hindered research with LSD for half a century. In 2010, a prominent paper published in the Lancet ranked LSD as the third least harmful of the 20 investigated, with alcohol sitting comfortably at the other end of the spectrum. Not only that, but early clinical studies suggested its ability to increase openness could have therapeutic uses in many mental health conditions, such as depression and addiction. Yet its label as a Schedule 1 drug has meant that research on LSD has been near impossible to gain approval for, or funding. With crowdfunding increasingly recognised as a way for scientists to be able to carry out the research that they, and the public, are passionate about, the team behind the study joined up with Walacea to reach out to the masses and secure the money they needed to make this study happen. And it’s been a huge success. After launching at the beginning of March last year, in just over a month the project received more than twice its £25,000 goal, raising a staggering £53,390. In addition, the coverage in the media was overwhelming, reaching audiences all across the globe. Although pledgers received some enticing perks, such as tickets to science seminars or invitations to dinner with the researchers, now it’s time for the real return we have all been waiting for: the results. “This is a very proud day for us, it’s taken 10 years to achieve this and it’s a very special day,” said Robin Carhartt-Harris at the beginning of his presentation about the findings of the study. When describing the study, Prof Nutt said: “This is the most significant research I have ever done.” Both emphasised how they hope that this research will open up the floodgates for future research into psychedelics and potential medical interventions. Headed by Imperial College London’s Dr Robin Carhart-Harris, in collaboration with the Beckley/Imperial Research Programme, co-directed by Amanda Feilding and Prof David Nutt, the study involved 20 participants who were either given a placebo injection of salt water or a moderate dose of LSD on two separate days. Volunteers then had their brains scanned using three imaging techniques, which all showed and measured something different: blood flow, connections within and between networks, and brain wave patterns. Alongside inducing visual hallucinations and profound alterations in consciousness in all participants, LSD was found to exert some fascinating effects on the brain. Certain brain networks that are normally well-connected became destabilized, resulting in a loss of integrity within these networks. In particular, decreased stability within a network called the Default Mode Network, which is active when we’re resting, was strongly linked with self-reported ego dissolution, or the loss of self-identity, and a more fluid state of consciousness. “Somehow, I was able to comprehend what oneness is,” said one participant. “I had a sense of being inside myself and outside of myself at the same time. I definitely felt removed in some way from what I would usually describe as ‘my self,’” another described. Alongside these pronounced effects within brain networks, the researchers found that LSD also caused an increase in global integration, with heightened connectivity between distinct brain networks becoming strikingly apparent. In other words, the brain seemed to be functioning in a much freer, more unified manner, something that also correlated with ego-dissolution. Last, but certainly not least, the team gained a fascinating insight into how the drug produces visual hallucinations. Normally, the brain’s primary visual cortex, the region that receives information from our eyes, only “talks” to other areas associated with vision, but upon taking LSD this area “exploded” and began communicating with many other distinct regions. This expansion of visual processing was linked with the degree of complex imagery seen, meaning images other than geometric shapes and flashes, like people and intricate scenes. On top of that, blood flow was boosted to regions involved in vision, despite the fact that their eyes were closed the entire time. Clearly there is much work to be done, but hopefully this work has opened the floodgates for research on psychedelics, and we’re excited to see how the scientific journey unfolds. Thank you for your support in helping make this amazing research come to life. Be sure to keep up with the Walacea page to find out what other exciting science projects you can back and become a part of! Remember science will happen faster if you support it!